Investigations, infrastructure, and immigration are among the issues that will dominate the 116th Congress when a Democratic majority in the House faces the challenge of working with a Republican-controlled Senate that’s wed to President Donald Trump’s agenda. 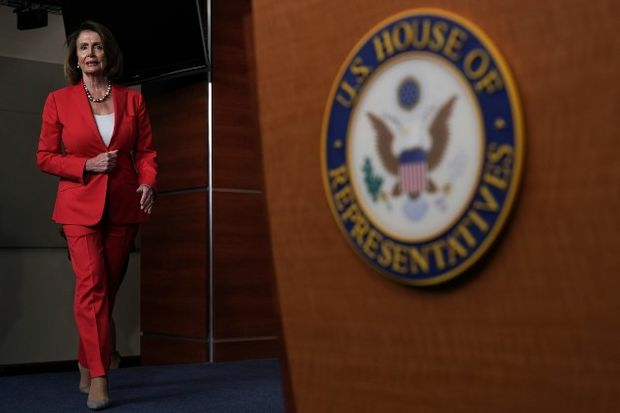 House Democratic Leader Nancy Pelosi (D-Calif.), now set to seek the speakership after her party picked up enough seats for the majority, said Democrats are more than ready to push their priorities after a half-dozen years of Republican control. U.S. House Minority Leader Rep. Nancy Pelosi (D-Calif.) June 7 on Capitol Hill in Washington, D.C. The party’s to-do list includes an ambitious infrastructure program, fixes to the Affordable Care Act, and an initiative to encourage voting and small donors. The party also may work to strike early deals on trade, prescription drug prices, and possibly changes to the immigration system with congressional Republicans and Trump. While Pelosi is the leading contender for speaker, she may face a challenge from Rep. Tim Ryan (D-Ohio), who leads a contingent of younger Democrats who want fresher faces in leadership. Look for more partisan friction and gridlock with Republicans keeping their Senate majority. Majority Leader Mitch McConnell(R-Ky.) has pledged to keep his own focus on confirming Trump’s nominees and promoting an anti-regulatory agenda. Many bills that a Democratic House may pass could run into strong opposition in the Senate. 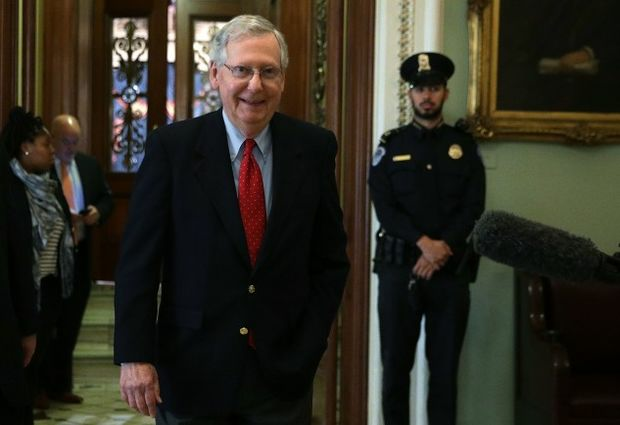 U.S. Senate Majority Leader Sen. Mitch McConnell (R-Ky.) walks from the Senate chamber to his office Dec. 1, 2017, at the Capitol in Washington, D.C.
One of the most visible changes will be the House Democrats’ plan to revive the oversight role of Congress, a task they say has been ignored by the Republicans over the last two years. Among the areas they plan to focus on are Russian interference in the 2016 elections, ethical lapses at the Environmental Protection Agency and the Interior Department, and Commerce Secretary Wilbur Ross’s plans to add a citizenship question to the 2020 Census. Look for hearings on Special Counsel Robert Mueller’s probe on alleged Trump campaign collusion with Moscow. House Democrats “will in the first week request Trump’s tax returns,” said Rep. Peter DeFazio (D-Ore.), who’s in line to be House Transportation and Infrastructure Committee chairman. Strategists in both parties already are warning that the opportunity for the two parties to strike any legislative deals will be short-lived. “That window will be at the beginning of the year — probably until July or August there will be an opportunity for forward movement and then we’ll likely see a very robust presidential campaign on both sides,” said Arshi Siddiqui, a former top Pelosi aide now with the firm of Akin Gump. Pelosi said her first move will be legislation that would create a small-donor public financing system, which would get the designation of H.R. 1. The measure would restore federal preclearance for certain states and municipalities with a history of discrimination under the Voting Rights Act that was stripped out by the Supreme Court. It would also create a nationwide voter registration. More likely to attract bipartisan interest is the infrastructure plan that she and Senate Minority Leader Chuck Schumer (D-N.Y.) unveiled in anticipation that Trump’s own proposal would get traction in the current Congress. Trump’s $200 billion plan primarily focused on transportation stalled amid concerns it lacked adequate funding and revenue sources. The plan Democrats want is five times that amount — $1 trillion — and also calls for upgrades to water systems, broadband, schools, and more. Democrats have proposed deficit spending to cover the infrastructure plans, and it’s not clear either side is willing to increase the federal gas tax to pay for upgrades. Both the scope of the proposal and money will be the focus of any bipartisan deal. The House and Senate also will consider the new trade agreement that Trump negotiated with Mexico and Canada to update the North American Free Trade Act and possibly other trade deals. Tom Spulak, a partner at King & Spalding and a former House Democratic leadership aide, predicts Congress will sign off on the deal with some changes. “By and large there was no consultation with Democrats so they can raise that and they may get some concessions,” Spulak said. Lawmakers haven’t ruled out another attempt to negotiate an immigration overhaul package, including a solution for the Deferred Action for Childhood Arrivals program to allow undocumented children brought to the U.S. as children to avoid deportation. Complicating any deal, however, are Trump’s demands for $25 billion in border wall money and more recent threats to do away with birthright citizenship. Republicans including Sen. John Thune(R-S.D. ), now in line to be McConnell’s top lieutenant, said there may be interest in an immigration deal after an election where the issue was front and center. “In the end it’s going to require Congress to engage on this, and hopefully to once and for all put a solution in place,” Thune said. A tougher sell will be Democrats’ plans to save or expand protections under the Affordable Care Act, including stabilizing the health insurance markets and insuring chronically ill people. Although GOP candidates in the 2018 campaign promised to protect coverage for pre-existing conditions, they also defended previous efforts to kill the law. Democrats said they might try to strike deals with the administration to reduce prescription drug prices. Efforts to expand benefits or boost infrastructure are set to bump up against a growing realization that the federal budget deficit is likely to hit the $1 trillion level next year, with the 2017 tax law (Public Law 115-97) projected to further reduce federal revenue. The ballooning deficit and federal debt are likely to be center stage this spring, when leaders will have to start negotiating a way to raise the nation’s borrowing authority. Congress has suspended the debt ceiling until March 1, although Treasury has tools to delay that deadline. At the same time, the two-year budget cap deal (Public Law. 115-123) that gave appropriators a generous framework for the fiscal year 2018 and 2019 spending bills is set to expire, requiring lawmakers to go back to the bargaining table soon. To even maintain funding level, they would have to raise the caps by $50 billion in both 2020 and 2021 — which adds another $100 billion to the deficit, Hoagland said. Without a budget deal, the battle over military and domestic spending will be back on the table and complicate the outlook for this year’s appropriations bills, Hoagland said. Democrats probably won’t try to upend the 2017 tax law, and they may even work with the GOP to make some changes to the statute, such as repealing the cap on state and local deductions. They also could seek to expand the earned income tax credit and child tax credit and establish new education tax credits. But don’t look for them to consider the GOP’s follow-on Tax Reform 2.0 plan that includes a bill (H.R. 6760) to make permanent individual tax cuts or Trump’s recent call for a new middle class tax cut. McConnell has said little about his legislative agenda or how he will react to House initiatives like the infrastructure plan. For now, the GOP leader wants to clear the decks of some 150 Trump nominees awaiting confirmation votes and prepare for even more next year. Still, McConnell has hinted he will pressure Democrats to ratchet back their plans and even cut Medicare and Social Security. “[I]t’s a bipartisan problem: unwillingness to address the real drivers of the debt by doing anything to adjust those problems to the demographics of America in the future,” McConnell said. Former Rep. Tom Davis (R-Va.) said the White House and congressional Republicans already have a three-prong agenda of their own that doesn’t focus on legislation. “It’s going to be executive orders, regulatory reform, and nominations,” said Davis, now director of federal affairs at Deloitte US. The post Probes, Possible Infrastructure Deal: What to Watch in the 116th appeared first on Bloomberg Government.